It's time for the prestigious Elysian Prize. Malcolm Craig heads up a committee that includes columnist Jo Cross, professor Vanessa Shaw, aspiring novelist Penny Feathers, and actor Tobias Benedict. This group is tasked with reading through a multitude of novels and deciding which will be on the short list and which one will win the coveted prize. The novelists being considered for the award are a strange bunch as well - Katherine Burns is as concerned with her newest lover as with the success of her novels, Sonny Badanpur considers his Indian heritage to be a crucial part of his story, and debut novelist Sam Black is finding success comes with a major case of writer's block. Things become more complicated when an assistant sends a family cookbook of Sonny's aunt to the committee in place of Katherine's book. What does it mean when a cookbook is a serious contender for a literary prize? Lost for Words is satire at its height. It is difficult to overlook the parallels between the fictitious Elysian Prize and the real Man Booker Prize, which St. Aubyn didn't win several years ago . The books that make the short list are varied. In addition to the cookbook and Sam Black's thinly veiled autobiographical novel, readers are treated to selections from a book from the point of view of Shakespeare and one written in Scottish vernacular entitled wot u staring at. While this book is consistently funny, it does ask real questions about literary culture. How can we possibly award just one book when there are hundreds of books published each year in varying styles about so many topics? Can any committee actually pick a winner when each of them have their own literary aspirations and entanglements? This book is a fun read but ultimately it is difficult to really remember the events or characters after the book is over. This is both the joy and downfall of satire. St. Aubyn is spot on as he points out the follies of every character within these pages. 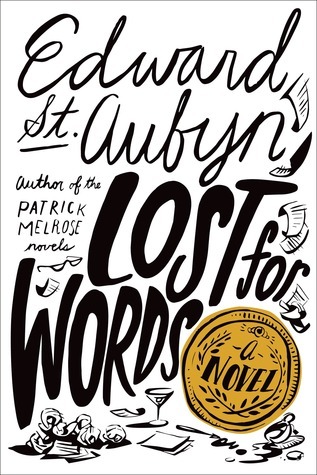 Lost for Words shows us the insanity of writing, of the publishing business, and of our attempt to weigh the value of books, delivered with a knowing wink and a good chuckle. Great review. I completely agree with your reaction to this one. It's an amusing, but forgettable, read. I still remember the reference to "giraffe carrots," though! I heard about another book that's a similar satire on prizes and awards: The Parrots by Filippo Bologna. Sounds like these two books would be good to read together. Too bad Lost For Words is so un-memorable. But at least you enjoyed it while you read it? I've been seeing them together a lot lately! I did enjoy it while reading it. It was a lot of fun! I'm not a huge fan of satire but the fact that this book deals with literary issues intrigues me. Very interesting review! Thanks. I don't read a lot of satire either but I think as people who love books, we have to chuckle at a few of his points!